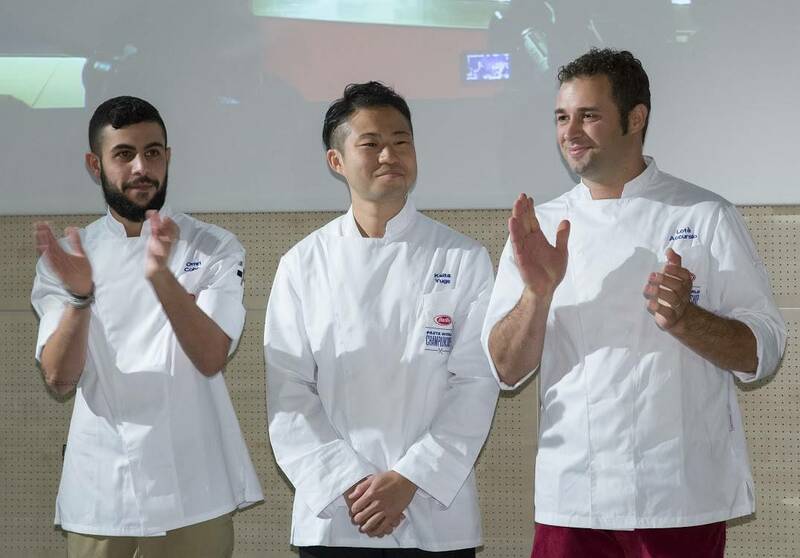 Before I describe the finals, and the extraordinary dishes these finalists prepared, let’s start with what hurdles these contestants overcame on Day 1 and 2. I was excited to see firsthand how twenty chefs from around the world would interpret this most revered Italian food. The competition was held over three days. I was to be a judge for Day 3, the finals, but was in the audience for the first two days. 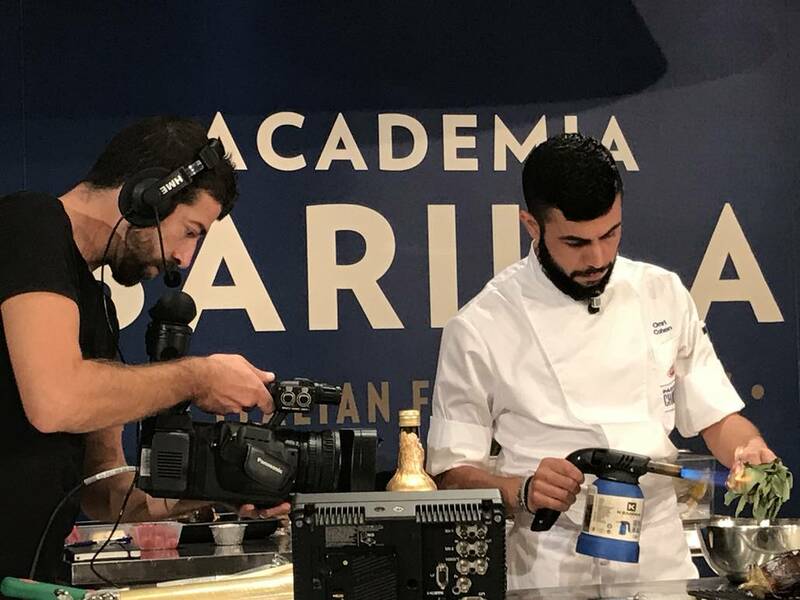 Day 1 started in Milan with twenty chefs coming from all parts of the globe including China, France, Greece, Israel, Italy, Japan, Poland, Russia, Turkey and the USA. Challengers had 1 hour to prepare their signature dish. It was quite a feat of organization to watch. The clock started every 10 minutes to stagger the contestants cooking a few at a time. Within minutes the theater was filled with intoxicating aromas. The clock ticked down for the final minute exciting to see who would finish on time. The next day’s challenge was pasta al pomodoro, and only 10 chefs made it through to this point. That was almost more exciting, to see what the contestants could do with pasta and tomato. 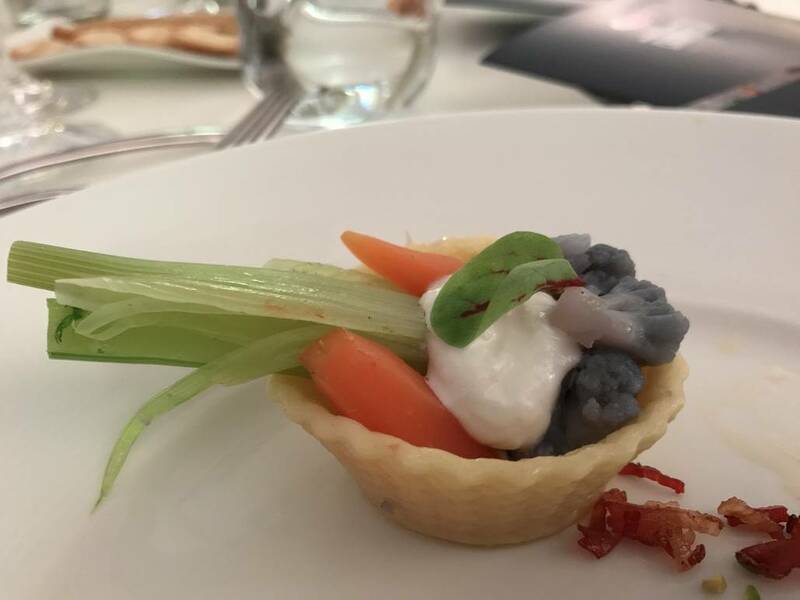 There were so many creative treatments, from a white clear tomato extract, to tomato sauce that incorporated Japanese herbs. 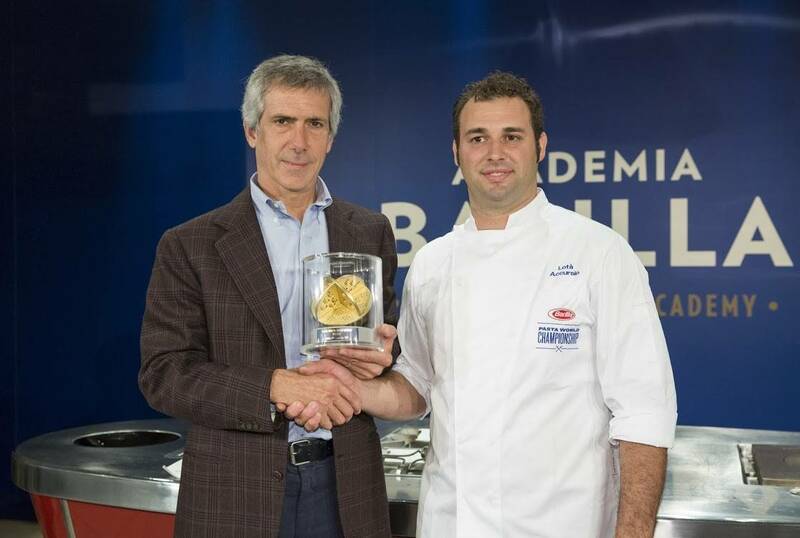 That evening, there was a gala dinner hosted at a Barilla facility, featuring 3D printed pasta. I had seen it before, but this was my first time to taste it. At the table where I was seated, my dinner companions and I were simply blown away, and we had so many questions—how many minutes did you need to print one piece of pasta, for example? How soon until our favorite restaurants would be using these printers? The machines printed out of fresh pasta dough in the shape of tiny amphoras, tiny baskets and spheres, each masterfully filled with delectable ingredients. It got me thinking how pasta is the most taken for granted food in the world. It’s everywhere on our supermarket shelves, and yet it is so amazing how many ways it can be treated, and how it now has limitless potential with different shapes. Gone are the restrictions that come with dry pasta. 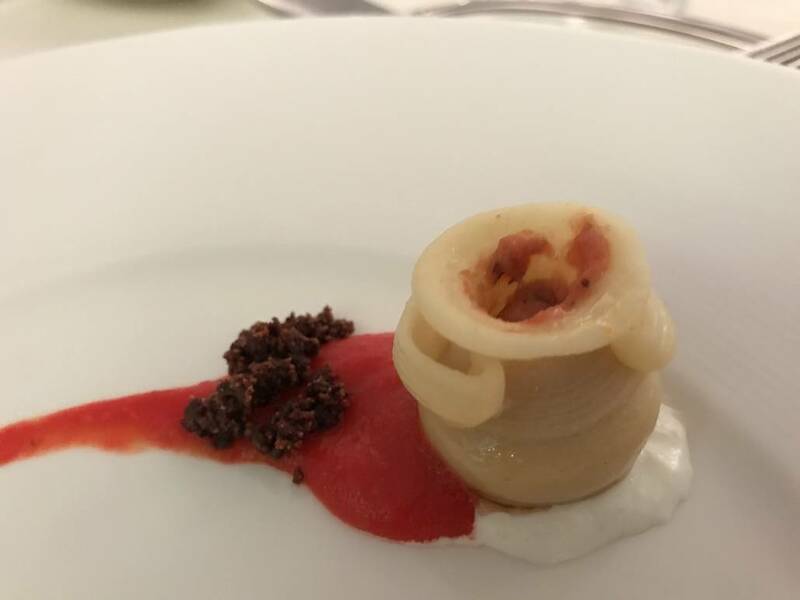 I had a realization: I’m having the future of pasta—even as I was having the 3D-printed amphora-shaped pasta, with its 2,000 year-old Roman roots. By now, only three contestants were left as finalists. 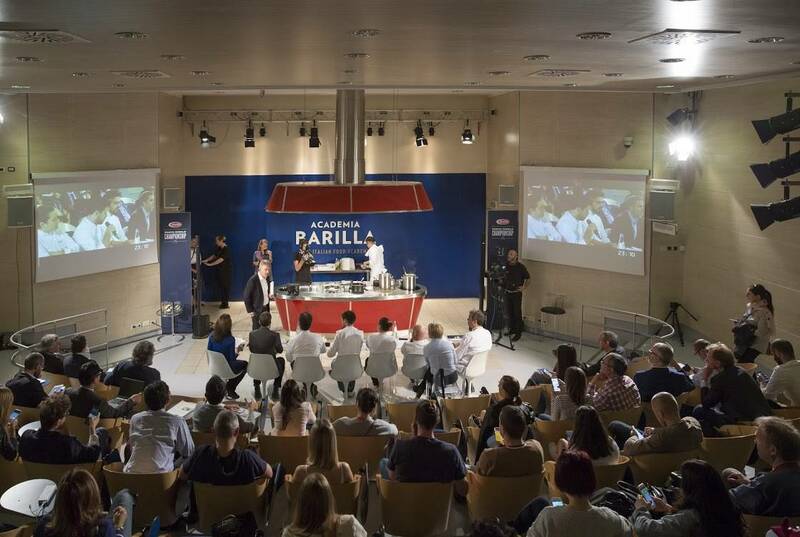 The finals were held at Academia Barilla, in Parma—a UNESCO Creative City for Gastronomy—where the chefs got just half an hour to prepare the same dish they had made the first day, but this time, in half the time, while being closely scrutinized by judges, by Paolo Barilla himself and with cameramen literally in their faces. I was very impressed by all three contestants, who were poised and seemed eager to begin the challenge. The first up, chef Accursio Lotá, from the restaurant Solare in San Diego, made Seafood Carbonara. He masterfully handled the many ingredients: Mazara red shrimp, Osetra caviar, squilla mantis, clams, mussels, tuna bottarga, sea urchin eggs, cured salmon eggs, ice, guanciale, amberjack, cuttlefish and scallops. Later, when I asked how he managed such great balance of so many salty ingredients he said, “I carefully tested how much salt to put into the pasta’s boiling water. It wasn’t easy.” The dish had an amazing citrus component: the zest of Sicilian green mandarin, which Lotá’s dad, who are from a small rural town in Sicily, loved to use. The red Mazara shrimp too was classic Sicilian. In the end, the fish was exquisitely cooked, the pasta perfect, and the combinations of flavors just perfect. 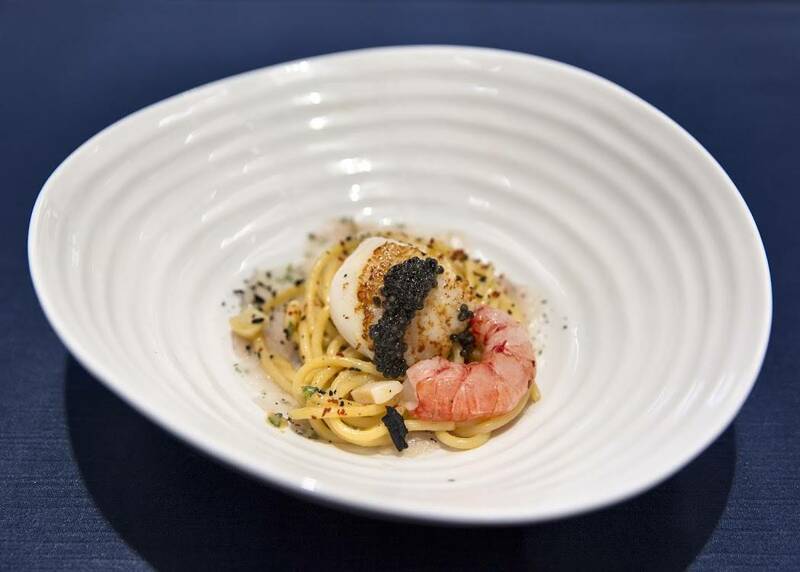 Next up was Keita Yuge, the chef from Japan made his signature dish: Pasta with Lentils, Variation of Scampi. He was so perfect in his timing, that you cannot help but think that he must have practiced 1,000 times. He added the last garnish just as the clock sounded the end, and then he calmly folded his hands. I expected a lot from him, because of his precision, of his creativity—as I’d had his dish on the first day. His dish had lentils and fish—which are very traditional Italian ingredients—but he also added a Japanese touch, with anchovy stock, yuzu, miso and Japanese basil. He’d made a lace out of butter and cornstarch, and a crisp sheet of thin leek for crunch, and they complemented the fusili, scampi, pancetta, almond slices, and garlic oil. The last chef was Omri Cohen, who was from Israel by way of Morocco. 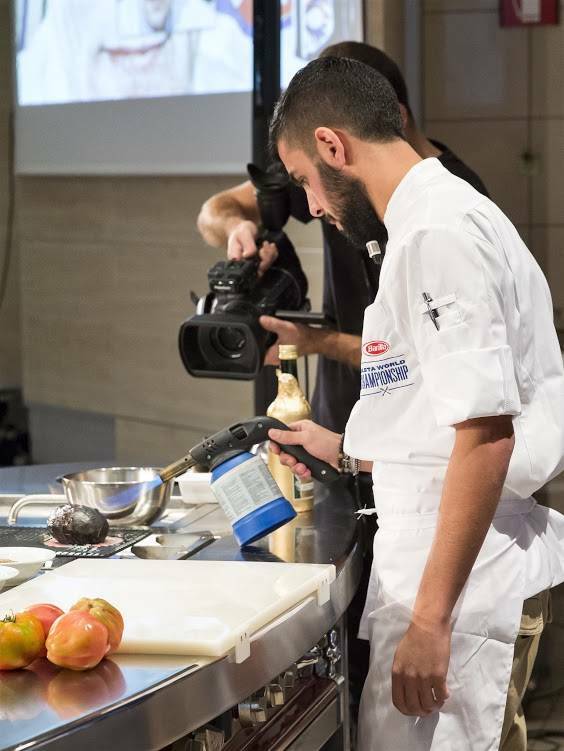 For his dish: Pasta with Steamed Grouper and Romanesco, he brought out the live fire—smoking sage, fire roasting eggplant, bringing out those intensely Mediterranean aroma until the room was filled with those scents, and people were oohing and aahing. It was audacious that he did this in just half an hour. Chef Cohen dazzled the judges with his showmanship and expert knife skills. As he handed us his finished dishes, he touchingly noted, “I put my heart on the plate.” There were a lot of Israeli flavors—the grouper fillets in kale leaves, I have no idea how he got them so soft—with romesco sauce with toasted white almonds, pine nuts, ground Shatta peppers, eggplant, bottarga, butter, sage, paired with linguini. Not only that, but the dish was topped off with zests from different citrus, making it exceptionally aromatic. We judges left the room, and brought along our notes. 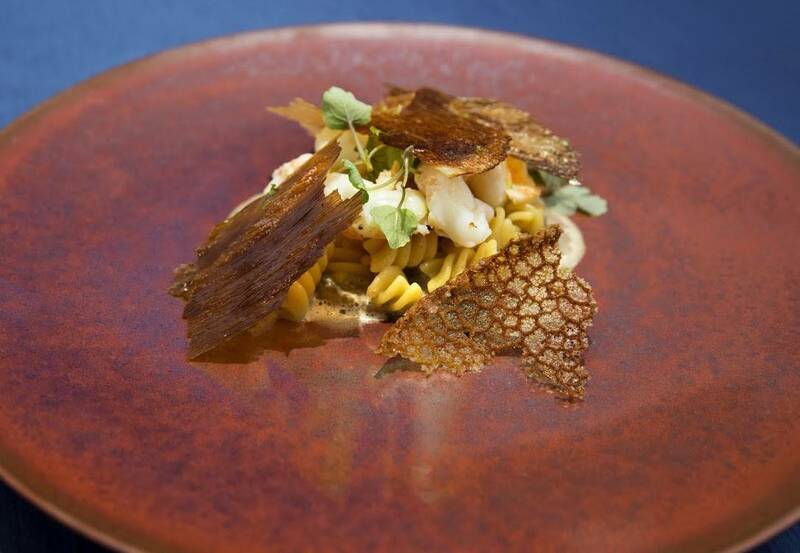 The criterion consisted of dish aesthetics, pasta texture, taste, cooking techniques, and how it fit in with the competition’s concept, the future of pasta. It was a very close, with all three dishes achieving high marks in all five criterion. It was interesting: once I was in that room, that’s when all my initial nervousness left me. We were now all partners in a bigger concept. There was no ego, and no one was being critical. The love of food came out. After much debate on all five criterion, we tallied our score sheets and a winner was unanimously voted. 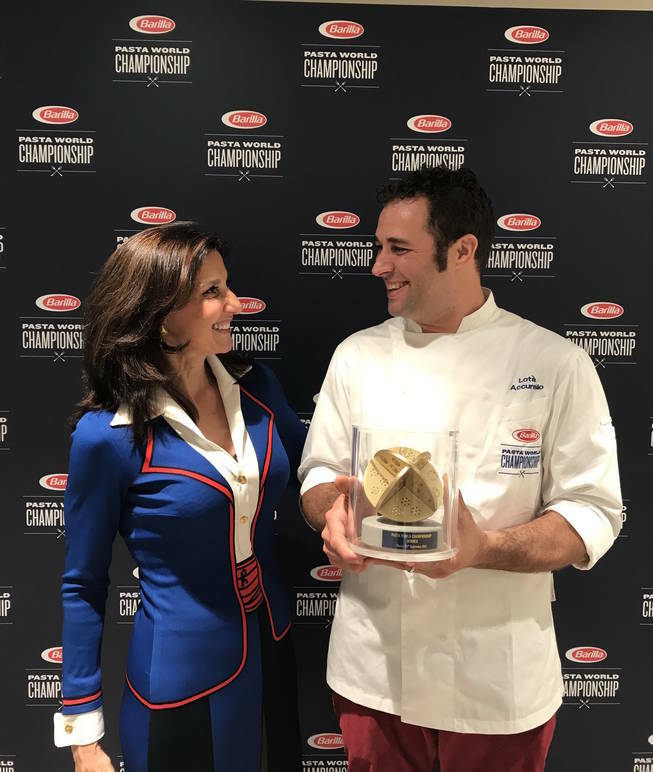 Lotà, the first place winner, was awarded a trophy in the shape of a pasta dye; the runners-up, Yuge and Cohen, received similar, smaller trophies. 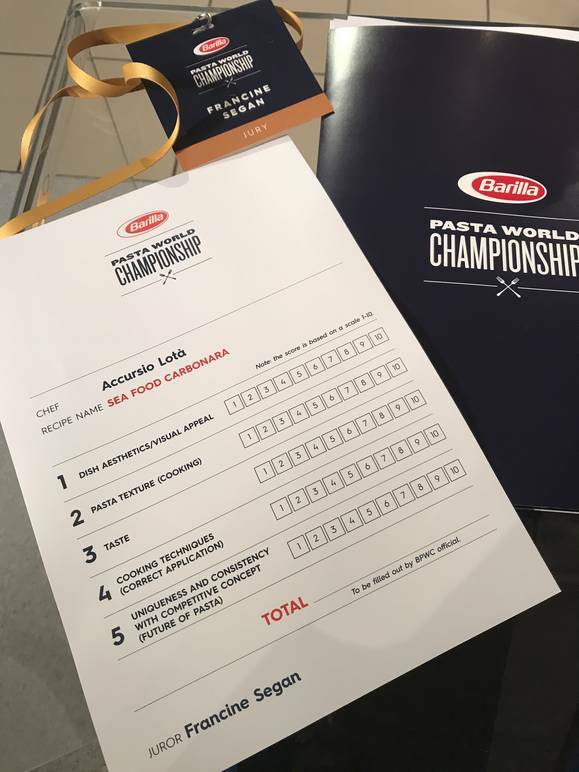 What did I take from my experience judging these pasta championships? 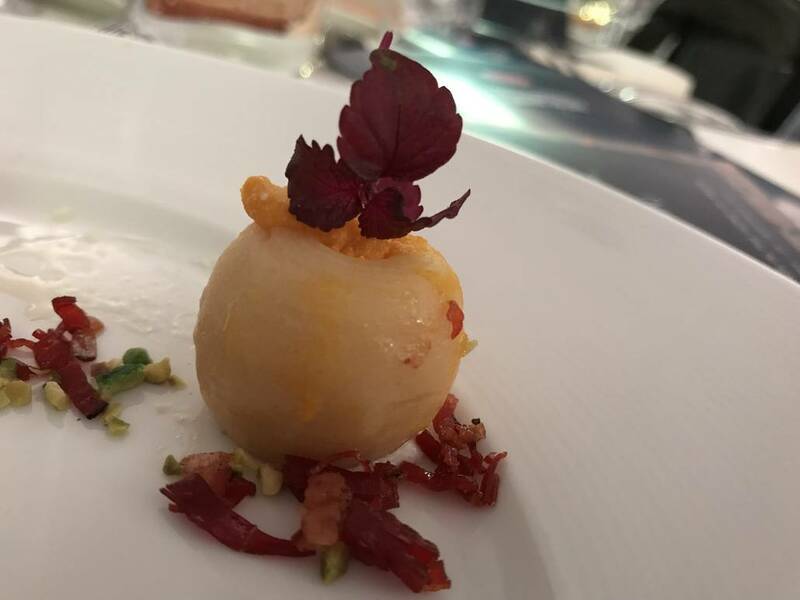 One, it’s amazing how a dish can change in a matter of just two days, just due to execution. And two, how pasta is an infinitely versatile canvas, open to interpretation in different ways around the world.